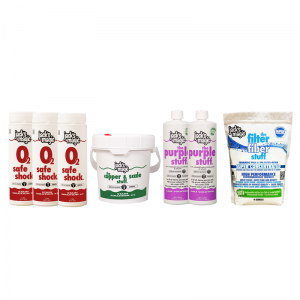 Jack Pacs Treatment Packs are pre-packaged kits full of exactly what is needed to treat a 10,000 gallon swimming pool as part of Step 2 of the Jack’s Magic Stain Program. 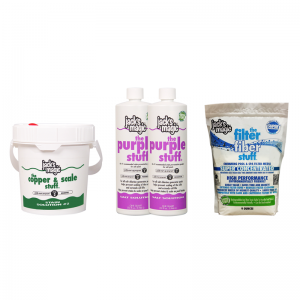 There is no guesswork as to what products you will need to complete a stain treatment! 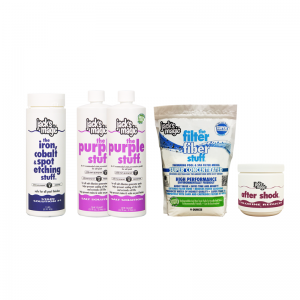 PLEASE NOTE: We would not recommend purchasing this Treatment Pack unless you have used a Jack’s Magic Stain Identification Kit and positively identified Treatment #4 as the best solution for your stain. I have brown stains in my pool. Will this Treatment Pack help remove them? We would always recommend that you refrain from diagnosing your stain by color and start by trying our Stain Identification Kit. Using the kit, you will identify which one out of four topical tests leads to the best results for your unique swimming pool stain. For more information, read about Our Program. Click here for instructions and dosages.